Featuring colorful geometric designs, these African baskets are popular for decorating walls and featuring on tables and counter tops. These beautiful baskets come from a group of women weaving in Southern Uganda. The Rwenzori mountains in the weavers' area seem a bit out of place in Africa with their snow and glacier covered peaks of close to 17,000 feet. 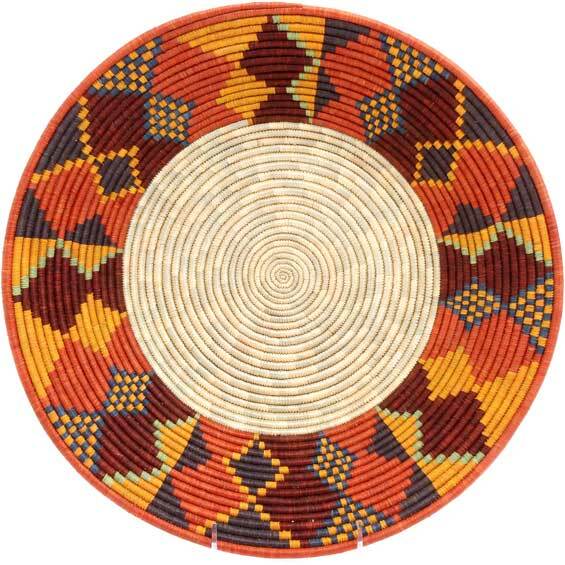 Traditionally used for serving food, Rwenzori baskets have a smooth surface and feature bold, geometric designs. They are created using tightly woven millet stalks, naturally dyed raffia, and sometimes local grasses. The vibrant colors come from natural dyes made from flowers, roots, leaves, and lichens grown by the weavers themselves.